[In 1851], the street passenger business in Boston and vicinity was handled by omnibuses. The single fare from Boston to Brighton was twenty-five cents, to Cambridge fifteen cents, and to Medford eighteen and three-fourths cents. A few year's later better accommodations were demanded; horse railways were proposed by some and opposed by others, until in 1852, the question was brought to the attention of the state Legislature and a charter for the Dorchester and Roxbury Railway—the first railway in Boston—was granted. In the following year charters were also given to the Metropolitan and Cambridge Railroads, and on March 26, 1856, the first street car in Boston was run between Cambridge and Boston. Later in the same year horse cars were running between Boston and Roxbury, and by 1858 Boston, Cambridge, Charlestown and Roxbury, with a combined population of 203,850, were provided for, although many parts of routes were in competition with the omnibus lines. The building of suburban horse railways gradually increased and tracks were laid in all the main city thoroughfares. Many companies, which built short lines, were chartered, and, naturally, the weak were absorbed by the strong until in the year 1865 only four companies were operating, each in its own district. The population served, including Boston and vicinity, was 324,180 in 1860, and 405,434 in 1870. In 1872 the Highland Company was incorporated, and in 1881 the Charles River Company. Both were lively competitors of the Metropolitan and Cambridge companies respectively, and in 1886 were naturally consolidated with their nearest rivals. The increasing business and financial success of street railway traffic attracted the attention of a syndicate of gentlemen, headed by Mr. Henry M. Whitney of Boston, and they bought a portion of the stock in the several companies and arranged a consolidation of all the street railways in Boston and vicinity except the Lynn and Boston. This consolidation went into effect November 11, 1887, under the name of the West End Street Railway Company. Almost immediately the officers of the new company began to study the question of equipping their road with electricity. The best experts were employed, costly experiments were tried, and after a very careful investigation it was decided to use the overhead trolley system similar to the one then in use in Richmond, Virginia. The work of equipping with electricity was begun in 1888, and the first electric car was run February 16, 1889. The consolidation of the several lines gave the people the opportunity to ride from the suburbs into and through Boston for one fare, where before they had paid two; the new electrical equipment materially increased the speed and allowed for the better accommodation of the rapidly growing population of Boston and vicinity. The natural result of a long ride for a single fare, greater speed, and a larger population was an increase in the passenger business, that of the West End Street Railway growing 23 per cent in 1889, 10 per cent in 1890, and 4 per cent in 1891. To accommodate this development many additional cars were run, and these occasioned a serious congestion in the principal streets in the crowded portion of the city, which increased each year and was the cause of great inconvenience to the public. During the rush hours, passengers using the Tremont Street cars near the Common were delayed in reaching their homes or in crossing the city by a long line of blocked cars which barely moved. The time required in passing through the congested portion of the city, about a mile in length, was frequently more than was consumed by the express trains on the steam roads running a distance of thirty miles into the country. The people were agitated and demanded relief; some suggested elevated railroads, others street widenings or tunnels. In 1891 the Legislature authorized the city of Boston to appoint a commission to consider the question of rapid transit and report a plan. The report was made in 1892, and recommended the rearrangement of the terminal facilities of the steam railroads entering Boston; street widenings; a rearrangement of the surface tracks, the removal of a large number of them from narrow streets in the congested district and the placing of them in a tunnel or subway under Tremont Street, which would provide for the greater number of the through cars to the southerly and westerly portions of the city; and two complete lines of elevated road, one from South Boston to Charlestown, and the other from Roxbury to Cambridge, the two lines to be connected at Causeway and Eliot Streets. The Boston Transit Commission was created by the Legislature in 1894, and was authorized to build a subway under or near Tremont Street to extend northerly to about the North Union Station. The legislative Act under which the Transit Commission was authorized to construct the subway also granted a charter to Joe V. Meigs and others to build an elevated railroad through the congested part of the city. 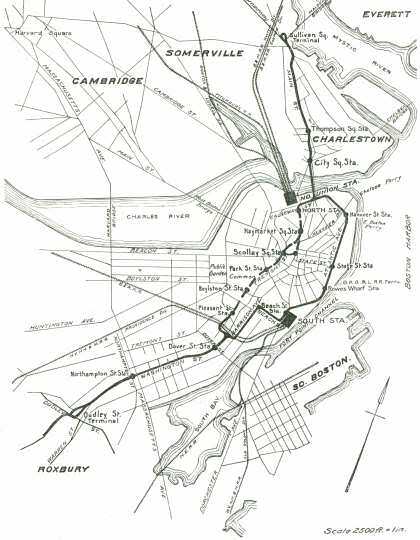 A main line was authorized from Sullivan Square, Charlestown, to Milton, passing through Haymarket Square, Congress Street, Post Office Square and Federal Street; a main line from Somerville through East Cambridge, over Craigie Bridge, Leverett Street, Brighton Street, Causeway Street, Portland Street, Washington Street, Devonshire Street, Arch Street, Harrison Avenue, Kneeland and Washington Streets to Forest Hills; and a third main line from Harvard Square, Cambridge, over the West Boston Bridge, Charles Street, Park Square, Pleasant Street, Tremont Street, Pynchon and Centre Streets to Jamaica Plain. From the three main lines, branches were authorized to Brookline, Everett, Chelsea, South Boston, Brighton and other suburban places. The Act authorized the building of the elevated road "according to plans or systems shown in patents granted to Joe V. Meigs, or according to such other plans or systems, except the system now in use in New York known as the Manhattan system, as the board of railroad commissioners may approve." The Transit Commission commenced their surveys and studies for the subway immediately after their appointment. The actual work of building the subway was begun on March 28, 1895, and the portion between Park Street and the entrance at the Public Garden was opened for passengers on September 1, 1897, the remainder on September 3, 1898. The length of the subway is about a mile and one-third from either of the two southern entrances to the northerly portal, which is near the North Union Station. The floor will average about eighteen feet below the street level, and a portion is provided with four tracks; and other portions with two tracks. There are five stations all arranged with "island platforms" or platforms between the tracks. The stations are lighted with arc lights, and the subway between stations with incandescent lights. Before the subway was completed, it was leased to the West End Street Railway Company for a term of twenty years, the yearly rental to be four and seven-eighths per cent on its cost, which was about $4,250,000. The completion of the subway was a great advantage to the traveling public, as the long delays on Tremont Street, which caused so much trouble, were avoided. The cars now pass through the subway in about one-­third the time formerly consumed for the same distance on the surface, and a passenger is reasonably sure of reaching his destination on time. The Act of the Legislature which authorized the building of the subway also required the removal of the surface tracks over that portion of the subway in Tremont Street between Scollay Square and Boylston Street, and on Boylston Street between Tremont Street and Park Square. In 1899 the Legislature passed an Act authorizing the relocation of these tracks with a proviso that the Act should not take effect until accepted by the popular vote at the municipal election, but the people rejected the Act by a large majority. The tracks were therefore removed. In 1896 a few of the larger and more progressive stockholders of the West End Street Railway Company purchased the charter granted to Joe V. Meigs and others in 1894 for building elevated railroads, and immediately engaged in the study of the transportation problem in Boston and vicinity. Granting locations in streets for elevated structure and stations, and connecting the same with the subway at the northerly and southerly ends, and the use of the subway for operating elevated trains; authority for the company to collect a five-cent fare for a term of twenty-five years. No tax not already imposed or hereafter to be imposed by general laws on street railway companies to be during a period of twenty-five years imposed on the lines owned or leased by the company. In addition to the regular taxes and in compensation for the use and occupation of the streets by its elevated railroad and leased surface lines, the corporation to pay to the Commonwealth annually during the term of twenty-five years seven-eighths of one per cent of its gross earnings. This might be termed a preferred payment, as the statute requires that this sum must be paid to the Commonwealth whether a dividend is paid to the stockholders or not; if the dividend paid exceeds six per cent, then a sum equal to this excess must be paid to the Commonwealth in addition to the seven eighths of one per cent of the gross earnings. The Commonwealth to distribute the money received, as compensation for the use of the streets, among the cities and towns in proportion to the mileage of elevated and surface tracks in each. A free transfer system for passengers traveling in the same general direction. The Boston Elevated Railway Company to lease the West End Street Railway. The original, or Meigs, charter of 1894 authorized the construction of an elevated railroad through the congested part of the city, through some of the principal streets, many of which are narrow and bounded on either side by valuable real estate. 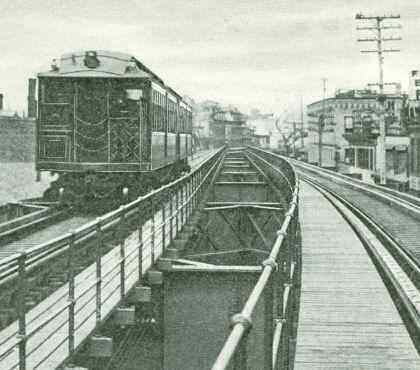 To make use of the subway for passing trains through the congested portion of the city would avoid the erection of an elevated structure in these crowded and busy streets, and, with this in view, a system of elevated roads was laid out and is now nearly completed from Dudley Street, Roxbury, northerly through the city proper via the subway, to Sullivan Square, Charlestown, except a loop on the easterly side of the city via Atlantic Avenue, passing the new South Terminal Station and along the water front, by the ferries and steamboat lines. The distance from Dudley Street to Sullivan Square is 4.9 miles via the subway, and 5.4 miles via Atlantic Avenue. There are in all eighteen stations, of which twelve are on the elevated portion and six in the subway. The average distance between stations on the elevated is six­tenths of a mile, and in the subway one-fourth of a mile. In making the return trip from either terminal, the trains run around a short loop, thereby saving the time and inconvenience of reversing the train. The terminal at Dudley Street is located at the junction of several surface lines which reach important suburban districts. A large proportion of the surface cars pass up an easy incline on each side of the elevated structure to the level of the elevated station, where the passengers change cars by walking across the platforms to the elevated trains. By means of these inclines for surface cars, the passengers reach the elevated station without climbing the stairways. The surface cars reverse their direction by running around loops on the outside of the station, as shown in the illustration. The cross town line cars and some others pass under the elevated station, and passengers transfer from one surface car to another, or to and from the elevated trains overhead. The northerly terminal of the elevated line is at Sullivan Square, Charlestown, at the junction of several important surface lines. The cars from the surface lines reach the elevated level over two inclines, as at Dudley Street, but the arrangement differs from that at Dudley Street in that the surface tracks terminate in the large station on either side of the elevated tracks. instead of passing around loops as at Dudley Street. There are ten tracks for surface cars, five on each side of the track on which the elevated trains are operated. The station has ample waiting rooms and suites of offices for the superintendents of both the elevated and surface divisions. The local or cross town surface cars pass under the station at the street level, where passengers transfer in the same manner as at Dudley Street. Fronting on the main streets are stores which will be rented for business purposes. The way stations are so arranged as to be easily accessible from the street, and also provide passengers with an easy means of transfer between the surface cars and elevated trains. At the South Station connection is made between the large railroad terminal station and the elevated station so that passengers who wish to reach the steam trains pass over a short bridge directly into the terminal station. By a similar arrangement at the other end of the city passengers pass between the elevated station and the North Union Station over a bridge which spans Causeway Street and connects by a stairway with the sidewalk in front of one of the principal entrances to it. All the stations are connected with the street by two flights of stairs, one for passengers entering, which leads to the ticket office and waiting room, and the other for passengers leaving, which, avoiding the waiting room, leads directly from the station platform to the street. By this arrangement there will be no confusion between entrance and exit passengers. The elevated structure is built of steel, and the design for the most part is what is known as the open web or lattice girder. It is supported on steel posts, most of which are fifteen inches square. In the narrow streets the structure spans the roadway with the posts on the edge of the sidewalk, while in the wide streets the posts are set in the roadway on either side of the surface tracks. The foundations for the posts are of concrete made of broken stone, sand and cement mixed in the proportion of 6, 2 and 1. The foundations begin about ten feet below the surface and average about nine feet square at the base, gradually diminishing in size to the cast iron bases on which rest the steel posts supporting the structure, which are firmly anchored to the foundations by long steel bolts imbedded in the concrete. Near the waterfront most of the concrete foundations rest on piles which are driven into the ground for a distance of from twenty to fifty feet. Some of the foundations were very expensive, owing to the soft material in which they were constructed and also on account of the large number of underground structures which were encountered, many of which it was necessary to change. On the longitudinal steel girders are placed the cross ties, to which are spiked the steel rails with steel guard rails bolted to them on all sharp curves. Then four large guard timbers are placed longitudinally along each track. which, together with the ties, are firmly bolted to the steel structure, as shown in the illustrations. The first work of construction, in a small way, was the building of the foundations for the posts in connection with the new Charlestown bridge over the Charles River, in 1898. The first active work of constructing the foundations for the elevated structure in the streets was begun near Dudley Street, Roxbury, on January 23, 1899; the honor of removing the first shovelful of earth was given to little William Gaston, then two years of age, the son of the president of the Boston Elevated Railway Company, and grandson of the late Governor Gaston. 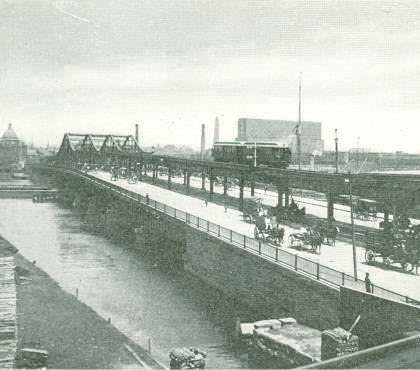 The first steel structure was erected on the Charlestown Bridge on March 30, 1899, and completed on that portion of the line near Guild Street on May 31, 1901. The steel structure runs for nearly the whole distance over a line of trolley cars. 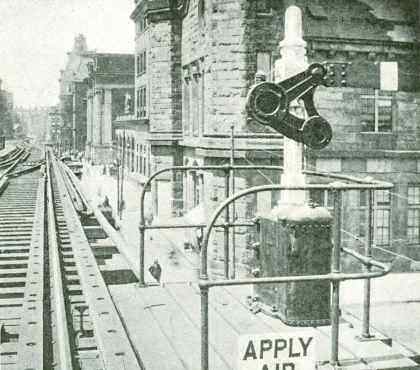 By reason of the large amount of travel in the city streets and the danger which would be incurred in working over live trolley wires, the erection was carried on at night, the surface cars were transferred to other routes, and the wires removed. 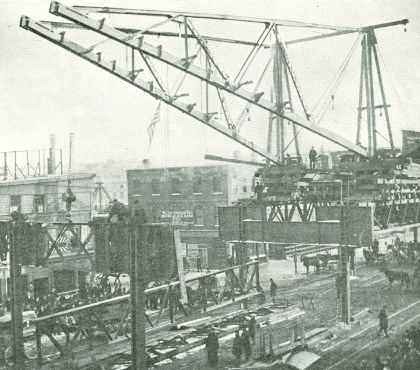 The posts and girders were completely assembled and riveted at the bridge shops, delivered in Boston on the steam cars, and hauled to the site on large trucks. A traveler or derrick was erected on the completed parts by which the posts, girders and other members of the framework were hoisted from the street to their proper position. When one span was in place, the traveler, which was wheels, was moved forward by steam power and made ready to erect the next. On the straight portion of the line the work was carried on with great rapidity; in one instance twelve spans, or 643 feet. were put up in a single night. The illustration shows the method of erection and the large truck used in conveying the long girder through the streets. The power for operating that part of the elevated system in the vicinity of the new Lincoln Power Station on Commercial Street near the North Ferry is supplied by that station, while the remaining parts are supplied by the several surface car power stations. The location of the new power station is a favorable one, as it is central to the work to be performed, and is built on a wharf where large vessels can land coal at a minimum cost for freight. The harbor also provides an ample quantity of salt water for condensing. The station consists of two buildings adjoining each other, one for the boilers and the other for the engines. It is built on a concrete foundation resting on piles from twenty to forty feet in length. The frame of the buildings is of steel, and the walls of brick with stone trimmings. The chimney is two hundred and fifty-one feet high, with a flue thirteen feet in diameter; its diameter on the outside at the base is thirty-three feet. The chimney is supported on a foundation of concrete, reinforced by steel rails embedded in it at intervals, the whole resting on piles driven with great force to a solid bearing. The total weight on chimney foundation above the top of the piles is 10,094 tons. The present station is so arranged that it can be extended to the east or west to provide for future demands. Three engines are now being built with a total nominal capacity of twelve thousand horse power, but capable of producing fifty per cent additional power for short intervals. The proposed extension of the station will allow an increase of double its present capacity. The coal is to be hoisted from the vessels in the dock to a conveyor, which will deposit it in the large elevated bin in the station just above the boiler. The illustration of the unfinished station shows the outside of the coal bin with its sloping walls. The capacity of the bin is three thousand tons, and the coal will drop through spouts to the fires where it will be handled by the automatic stokers. The ashes will drop from the fires under the boilers into a hopper, then to the conveyor, which will deposit them in a large bin. The engines are of the type known as vertical compound, with a capacity of about four thousand horse power. They are directly connected with the electric generators of twenty-seven hundred kilo watts capacity. The elevated cars are much like those used on steam railroads, but smaller, and the general dimensions are practically the same as those of the cars now in use on the New York elevated. In addition to the usual doors at each end, there are also doors in the center on each side, which are opened and closed by the platform men at the more important stations and during the rush hours. The seats run longitudinally just as in the cars now in use on the surface lines. On the platform at each end is a folding-cab, which may be entirely closed for the use of the motorman, or may be open for the free use of passengers in entering and leaving. Heat and light are supplied by electricity. On one truck on each car are installed two electric motors, each with a nominal capacity of 15O horse power. The current for these is taken from the third or conductor rail through the contact shoe which slides along it, as shown in the illustration. This third rail is connected at different points along the line with the electric feeder system, which in turn is connected with the power houses. The third rail takes the place of the trolley wire, and the contact shoe the place of the trolley wheel, as used on the surface cars. This third rail is laid just outside of the two running rails, and rests on insulated supports which stand on the top of the ties; it is about five inches higher than the running rails, and may be seen in the illustration showing the track system and contact shoe. The insulated supports are so constructed as to prevent the electric current from reaching the structure. The electric motors are governed by what is called the "Multiple Unit Control," which, from the motorman's cab, at either end of any car, affects all the motors on any number of cars in the train. Usually the train, whether it consist of two or five or more cars, will be operated by a motorman who will occupy the forward end of the forward car. The handle which he uses is similar to those on the surface cars but smaller. It is arranged for greater safety so that, in putting on the power, the motorman must hold the handle in a certain position; if he lets go it will fly back and turn off the current. This system of equipping each car with a motor, rather than using one motor car with several trailers, has been the source of considerable discussion and controversy among railroad experts. One of its many advantages is that there are driving wheels on every car in the train, and on the Boston Elevated sixty per cent of the weight of the car and load will rest on the driving wheels. This is an important factor to be considered when running trains up the steep grades encountered on this road. The grade between the elevated portion and the subway is five per cent, and there is an eight per cent grade in the subway. As on most steam roads, the cars are all provided with automatic air brakes, but the system differs from steam railroad practice in that the power for operating them, produced by an electric compressor, is attached to each car so that it may be worked either in a train or separately by itself. The entire road is provided with an electro-pneumatic system of block signals, by which a train will not be allowed to pass into any section until its predecessor has passed out of it. This feature of the system is similar to that in use on steam railroads, but in addition to the general custom, provision is made so that, in case for any reason the motorman should run by a signal at danger, an arm which at such times project above the track engages a valve in the brake system, applies the brake, and automatically stops the train. At all junctions are electro-pneumatic interlocking switch and signal systems operated from five towers by compressed air, conveyed by a pipe laid the whole length of the road, and furnished by two compressor plants, one located in Roxbury and the other in Charlestown. There is to some extent a popular feeling that an elevated railroad is not as safe as one that runs on the surface. but the figures show that the contrary is true. For instance, a comparison of the returns made to the Railroad Commissioners of the state of New York from the Manhattan Elevated Railway and those made to the Massachusetts Railroad Commissioners by the Boston and Albany Railroad and the West End Street Railway, being the average of the results of four years, 1893 to 1896 both inclusive, shows that 3,453 persons were killed or injured on the West End Street Railway, 1,451 on the Boston and Albany Railroad, and 108 on the Manhattan Elevated Railway; or, putting it into another form, the ratio of the number of passengers killed or injured to the total number carried on the West End Street Railway was 1 to 172,889, on the Boston and Albany Railroad 1 to 34,324, and on the Manhattan Elevated Railway 1 to 7,374,790. On the surface roads, both electric and steam, many persons are injured on the streets and at street crossings, while the steps are so placed as to be the cause of frequent accidents. Of course an elevated road is free from both these, which probably in a large degree accounts for the difference. The construction of the Boston Elevated Railway has been carried out on a very broad and liberal basis, particularly in regard to safety. The foundations were designed and built to carry, at least, five times the weight which will probably ever be placed upon them. The supporting piles were tried by heavy loads to at least four times the amount which they will be called upon to carry, while the concrete was tested by the United States Government at the Watertown Arsenal, and found to be up to six times its load. The specifications for the steel work were very rigid, requiring that samples be taken and broken in a testing machine, and, if found unable to resist a certain strain without break, they were rejected. The track, which is very heavy and provided with safeguards to prevent derailment of cars; the block signal system, intended to keep the trains a certain distance apart at all times and prevent collisions; the automatic device for stopping the train should a motorman forget and run by a danger signal; and the automatic arrangement for shutting off power if the motorman should become disabled and let go the handle, all contribute to safety of operation. To recapitulate: The Boston Elevated Railway, as described, consists of about seven miles of elevated structure equipped with third rail, and three hundred and seventy miles of leased surface tracks equipped with overhead trolley. The tracks are laid in twelve municipalities, and the road serves a population of about one million people; it carried 201,124,710 passengers during the year ending September 30, 1900. The surface lines are equipped with 1,538 box electric cars and 1,442 open electric cars; and the elevated lines are equipped with 100 box cars. The elevated division is designed as an express system, the surface lines acting as feeders.